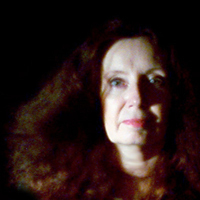 For nearly 40 years, Fiona Broome has been an author, researcher and paranormal consultant. An unabashed geek, Fiona analyzes and sometimes predicts paranormal activity. She studies patterns of all kinds, including ley lines. In ghost hunting, Fiona is fascinated by the reasons why some places and object (or the people around them) seem haunted… and others aren’t. Luckily (for her, anyway), she usually finds answers in history and geography. Sometimes, real history doesn’t match popular “ghost stories.” That’s exactly why it’s important: It gives us new clues to why some sites report paranormal activity, and where to look for even more. Fiona’s first ghost hunting website was “Yankee Haunts,” at GeoCities. In 1999, she launched Hollow Hill, one of the Internet’s first and largest ghost hunting websites. Since 1999, she’s continued to research paranormal activity and what causes it. For several years, Fiona was a regular invited Guest at Dragon Con and many paranormal conferences in the U.S. and Canada. Today, Fiona prefers to focus on her research and writing. Due to Fiona’s ghost hunting expertise, she was the model for the “Fiona” character in Trickery Treat, the final novel in the first Charmed TV series books. She’s also been a consultant for several other authors and TV series. Most recently, Fiona has been working on new books, new (free) ghost hunting courses, and her websites. You can see her latest news at Facebook’s Fiona Broome – News, and her occasional posts at Twitter. Her author website is at FionaBroome.com.